As a Canadian born outside of Toronto, there is only one team you grow up supporting. The Toronto Maple Leafs. For those of you without knowledge of the National Hockey League (NHL), it is a pro ice hockey team. The team dates back to 1917, not quite the history that comes with football clubs over the pond, but for what is quite a young nation, Maple Leaf hockey is a long and proud tradition. Just like in all sport, your families past generation’s pass down support, and this was the case with me. My entire family supports the Leafs, and everyone (mostly) in the community and surrounding communities, shares that passion. So one could imagine, it was hard as a kid brought up in the 90s to really be exposed to anything other than hockey, that is just what you did. You are born, you play hockey as a kid, and you support The Leafs. It’s Clockwork. I always enjoyed playing football as a kid, I didn’t have the passion for the game that I do now, as I was still in the traditional Canadian, hockey mold, but it was definitely festering. I never really played the game competitively, something now that I am older I regret, I played for my elementary school teams, but never for a league team. I was always playing ball hockey as a kid, it was and still is one of my favourite sports, and so I never had the time to play football. My whole life was hockey; I would play in the summers and winters, and watch my beloved Maple Leafs on TV. My first real exposure to football was the 98 World Cup, I was only 7 years old, and the brilliance of Zizou in the final was what really gravitated me to the sport, though I never thought it would evolve into the passion I have now. I can still see me and my brother on my basement couch, huddled around the TV, me cheering on Zizou and Les Blues and he the mighty Ronaldo and his Samba Masters. Though, back then I was only watching International competition, I was never exposed to the club side, and at that point still was yet to have an affiliation with a club. The Euro was next, the 200 final is still a game I can relive to this day, my French team, still driven by the great Zizou was up against the Italians. For some strange reason my brother was a big supporter of Toldo, and thus was rooting against me. I will never forget Wiltord scoring the equalizer in the depths of injury time, and Trezeguet scoring the winner in Golden Goal. One of my favourite moments as a football supporter that. Lets skip the 02 World Cup shall we… dark times. I don’t quite remember when, but sometime between the 02 and 06 World Cup, my brother introduced me to club football. I must also give some credit to my step-grandparents, who hail from the mighty Bury and are avid Manchester City supporters (can only imagine what it was like to be my Grandad, when Aguero scored that goal vs QPR… madness. Wish I could have been there to see his reaction, but I will get to the reason why I couldn’t) and they, along with my brother were really the ones who showed me the ropes. Now for a dark period in my life, I use to be a Manchester United fan. I know, I know, how sickening right? But to be fair, I never really watched any games. I can’t even remember watching one if I’m honest… but apart fromZidane, my favourite player back then was Van Nistelrooy. My mom is Dutch and so I try to pay attention to how Netherlands get on, and Van Nistelrooy was amazing. This just got worse didn’t it? A Van Nistelrooy loving United Fan? Just thinking apart that short time makes me sick. I truly am embarrassed. Lets forget that now shall we? Okay, good. As I have mentioned, my brother was a massive influence on my football path as a youngster, and as I got a bit older we truly shared a great bond over football, one that I cherish to this day. The only problem is that he is a die-hard Liverpool fan. As the Premier league became more accessible on Canadian television, I would watch more and more games and truly became engrossed in the sport. Than one day it happened. During the 07/08 season, I was watching Liverpool Champions League highlights (Yes, they did play in the CL at one point) and I came across Arsenal. Here was this team, made up of all these great players, ones that I recognized from my admiration with the French National Team. How had I missed this lot? So I went and analyzed the roster of this Arsenal team, and compared them to the United team. Wow. I hated every United player, and loved many Arsenal players. Henry was one of my favourite players; little did I know I wouldn’t get to watch him play for the Arsenal. My passion was really born late in the 07/08 season. 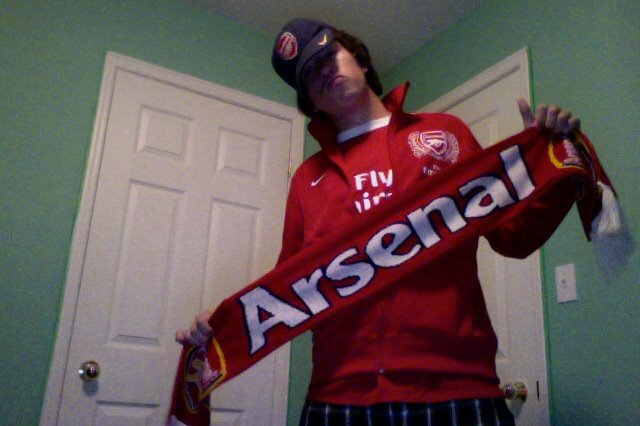 Around the time of the Arsenal v Liverpool CL QF, I have truly developed a love for the team. It was to be an exciting tie, one that me and me brother were really looking forward too. I had followed Liverpools trek the previous year, their thrilling run to the final vs Milan, and I had high hopes our boys could pull it off. It truly is a family affair now, the BPL is a fixture on Canadian television and my favourite time of the week is waking up bright and early on Saturday morning (7:45 for early kickoff) and cheering on the boys. Like I mentioned before, my brother is die-hard Liverpool fan, and he has managed to convert my step-mom from a City supporter to a very passionate Liverpool fan. 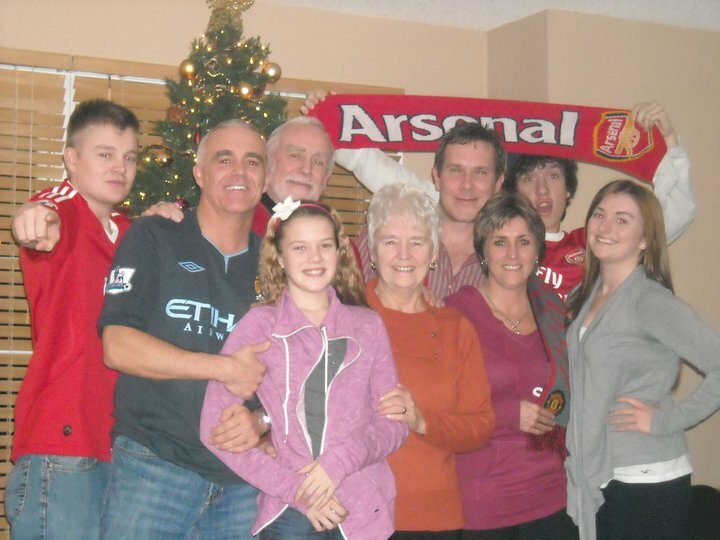 My grandparents are City fans, as is my Uncle, then there is my dad… United. Oh how I am enjoying the Moyes Era. It is an interesting atmosphere on Match Day when you are surrounded by so many different supporters, I think it’s almost a luxury of being a foreign fan. Our support isn’t segregated by geography; relationships formed by football can bring people together and rivalries breed competition, both are qualities I love. While we may fight and argue over our teams, it is the love of the game that really drives us forward and it’s something I wish native fans could experience. Though I do understand the passion that comes with being a generational fan, as I have experienced that with my love for hockey. I take you back to the final day of the 2012 season, I am in my basement watching tensely as we are under the kosh against West Brom, playing poorly and at 2-2, needing the win to secure 4th spot over the enemy. Dad and step mom are upstairs watching on as United are winning and City are down to QPR. During HT, my stepmom was thinking of going to my grandparents house, but didn’t want to be there if City were going to lose the title, it looked a good decision at that time. Up Step Laurent Koscielny. YES! Thank you Martin Fulop! As this is happening I am running upstairs to catch glimpses of the United game and the tension between my parents, my dad at one point slides on his knees in celebration. Up Step Aguero. My Word. My dad goes from elation, to desolation, in the blink of an eye, it was glorious. Here I am celebrating like mad for Arsenal clinching 4th (Oh when the Spurs, oh when the Spurs, oh When the Spurs blow a 10 point lead, I want to be In that number! Oh When the Spurs Blow A 10 Point Lead!) and my dad going mental. I struggle to summarize my love for The Arsenal, the bond is that strong. It really goes beyond description, which is a lot to say coming from a 22 year old Canadian who grew up in a hockey family and in a city with the greatest and most famous hockey team of all-time. Everything about the Arsenal I admire, from Arsene, to the respect, the class in which the club operates, I can go on and on, but you all know the qualities of which I speak. Of course then there is the football. It really it different class at times, Arshavins goal vs Barcelona is the greatest moment in my life, that play was brilliant, Jack with the nice touch to Cesc who played the long ball out to Nasri and the rest is history. Just a shame what happened with Robin in the return leg, we were playing quite resolute till that point. That football is returning now, Ozil/Ramsey/Cazorla/Giroud are really playing their butts off and just playing teams off the pitch, harnessing their inner Cesc/Nasri/Song/Robin and at times, their Bergkamp/Pires/Viera/Henry. I won’t even try to put into words my feeling when Henry scored vs Leeds. Sure we have hit hurdles here and there recently… Cesc, Robin, Birmingham, Barcelona, Eduardo, United in the CL Semi, Bradford. But every club has their ups and downs, and us as supporters, just have to back the boys that much more when they are down so we can truly appreciate the good times. Arsenal Till I Die, I’m Arsenal Till I die, I know I am, I’m sure I am, I’m Arsenal Till I Die. This entry was posted in Arsenal and tagged Arsenal, Laurent Koscielny, Liverpool, Manchester United F.C., National Hockey League, Ruud van Nistelrooy, She Wore, She Wore A Yellow Ribbon, Toronto Maple Leafs, United on November 25, 2013 by keenosafc. This resonated with me because I’m both an Arsenal fan and now a more recent hockey fan. I grew up in nontraditional hockey markets in the US, but moved to Raleigh (another nontraditional market) about the time the Hurricanes (Whalers) did, so when they made their Cup run in ’02 I was hooked, and then winning the Cup in ’06 was a culmination. I am lucky enough to get to 6-8 games a year here now though. But I didn’t grow up with it like you did, so I feel the foreign fans can’t be real fans, or bandwagoning fans thing you mentioned for both hockey and football. Let’s just hope The Arsenal don’t have as long a trophy drought as the Leafs have had.